Best of luck keeping your toilet paper dry. I don't know how the Reese sales lady can be so definitive about your splash distance. 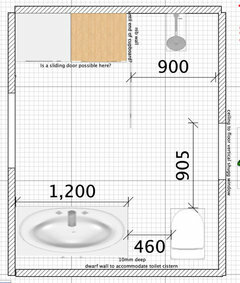 It will depend on the position of the shower rose (not shown on the plan), the height of the rose, the water pressure, and the height and size of the person showering. Your floor will also need to be properly graded, and I would add another floor waste to be on the safe side. She may be right, but if it was my bathroom I would not risk it, as I hate mopping floors. It is also tricky to add in a frameless shower screen after the tiling has been completed, if she is wrong. As I said, best of luck in keeping your toilet paper dry - your recessed cavity sliding door will limit the opportunity to fix the toilet roll holder to this wall. With small bathrooms there is so much to consider to get it right, and mistakes can be expensive to rectify. I have 2 walk in showers and would say you would want a min of 1500mm to keep everything dry, but would depend where the shower head is placed. Could you design it so you could try without but if needed add the glass panel in if it doesn't work out for you? I have a walkin shower; however, I think your shower is too small to be a walkin. I think that you will also need a door on the shower. The Reece lady was actually running the workshop so she seemed very knowledgable and confident in what she was saying. She pointed to a 1200X900 shower in store and said that you wouldn't need a screen on the end. She said that the water head, if positioned coming straight down from the ceiling close to the far wall (where the vanity is) - then the water is designed to come straight down and that you might get a few minor splashes where the toilet is but certainly nothing like is being described here? When I showered this morning I took extra notice. My shower is walk in 2000 x1000. We have a rain shower head from ceiling. The small splashes did reach to 1200, as this is the length of my side wall. If you have the rain shower head positioned too close to wall, Then you might find you a not standing comfortably when having a shower. Our shower head centre, is 450 from end wall. This could be changed by maybe 50mm, depends on your own personal space required for a comfortable shower. It also depends on the person who is showering. Their height and build. My main bathroom has a 900 x 900 shower with tri panel sliding door. When one panel broke and there was a one third gap, on the end furthest from the shower head, there was a lot of water splashing out onto the adjoining floor. If you are having a rain head shower at the vanity end of the recess then make sure that you have adequate waterproofing and proper details to the window in your shower. Your standard window with timber reveals and MDF architrave will just rot out. I tend to avoid designing windows in showers as it is tricky to get the waterproofing details correctly built, which just leads to long term ongoing problems. 'There won't be much splash.....' but it depends on your opinion of how much splash is acceptable.... I'd go will glass or a tiled wall to contain it. Do you really need the study nook in the adjoining room? Perhaps it could be incorporated into the bathroom space. Unless you have a walk in shower over 1800mm long it's not a safe option. A door is recommended. A fancy shower head with supposed "splash limiting technology" positioned wherever outputs water regardless, and it's the water hitting your body and bouncing off that which will cause the splashing beyond the shower. You can still have a nice seamless look with integrated tiled base and frameless panels/door. What are the best ideas for luxury bathrooms? Anyone can share the pictures of latest bathroom fittings? Our walk in shower was 900 wide with a 1200 glass panel. We had a combined shower head on a rail with overhead rain shower. Very slight splashing extended about 200mm beyond this but it was never an issue. Our shower is 1400 x 1400 with no door. Hardly a drop of water outside this area. Even if there is a few splashes, (my husband is a big guy!) it’s where the bath mat goes anyway. I never have to wipe the floor. I have to vouch for the Reece lady. They are well trained and usually are quite correct in giving advice. 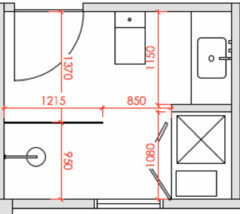 I have a 1400x900 framed glass shower enclosed on all sides. Not a rain head but just a wall bracket showerhead. That far end glass got splashes only at the bottom. A rainhead will be more concentrated. If your plumber can angle the rainhead just a little tiny bit towards inside, it will solve all your problems. I now have a designer who did 4 options with the larger space. These all give me a decent size shower (not enclosed!!) and vanity and a long vertical sash window in the centre of the far wall which will be a feature with greenery outside. I also have my design. (Nib wall idea thanks @ Siriuskey) Which one do you think works best in terms of space, and functionality and esthetic? 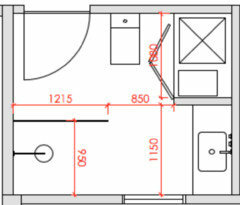 Option 2 has a retractable door on the Laundry - what does that look like ? Advantages? The designer has also ditched my entry sliding door for a conventional door?Is this better ?? I think options 3 and 4 are questionable with you having to walk around the toilet to get to the vanity and laundry? 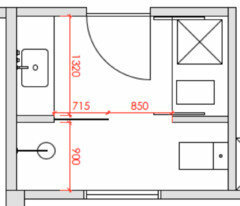 Also, how high would the vertical window go on a 3 metre ceiling? Number 1 is my choice. I agree with long beach. Option 1 but switch door to open the other way. If you are using the laundry, with door in option 1 the door has to be closed. Other way it covers the toilet and can stay open while using laundry area. You would think it doesn't need to be open while using the toilet! 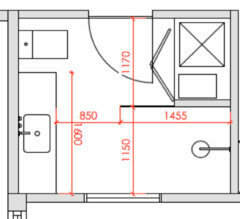 I had just the arrangement you propose with 1.4m from toilet to wall with showerhead centred about 40cm from wall. It bathed the toilet every time we used it. I installed a 75cm glass screen about 20cm from toilet and splashes go about 60cm up the glass. No need for door. Just put a bath mat across opening. Hi ceewan. Are you able to send a pic? 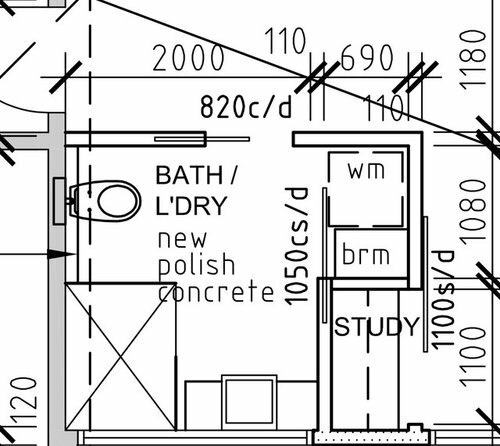 In Option 1, the distance between the vanity and the shower head wall is 2245 mm So I'm assuming this is enough distance and the vanity won't get splashes? Yay or nay? Toilet showers!